The following links will let you download materials like SketchUp Models, spreadsheets and other supplemental materials that we may use in class to illustrate a point or for an interactive exercises. I will also post any materials we develop or reference during the class each day after class in a follow-up folder for the day. Note that these links are for the most recent/current class. For previous class materials, visit the University of Wisconsin DDC Systems Class Archive Page. The interactive exercise we did is built around the imaginary Bureaucratic Affairs Building on the Center of the State University campus (COStU) in Golden Girl Missouri. The basic files you need if you want to revisit the exercise in depth and try your hand directly at adding the logic enhancements we discussed can be found on the Bureaucratic Affairs Building Heating Hot Water System Logic Modification Exercise page of the web site along with a general over-view of the exercise. There is also a blog post that will connect you with additional control system design resources and help you get up to speed using SketchUp via an "Easter egg hunt" exercise you can do in the Bureaucratic Affairs Building model. If you want a clean version of the logic diagram tool, you will find the current version of it on the Logic Diagram Tool page of the website along with the PowerPoint file that defines the symbols and illustrates how they are to be applied. A copy of the logic diagram tool with the enhancements added to the basic logic we were looking at. 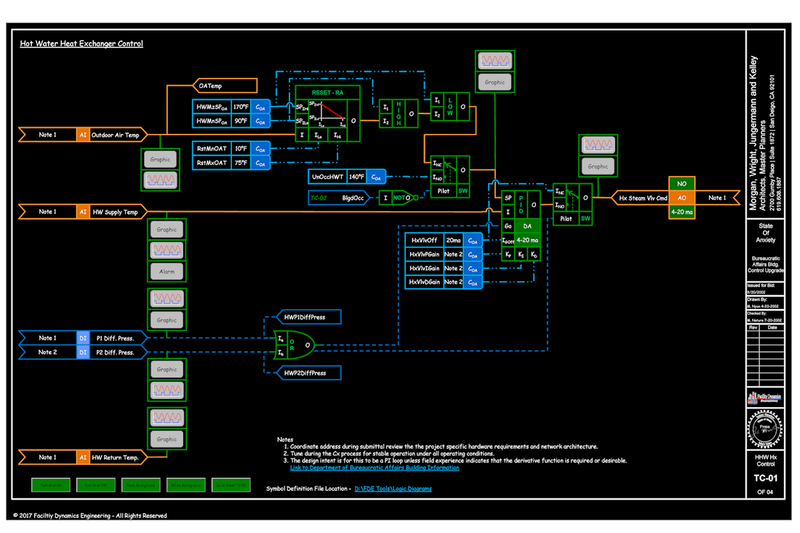 A copy of the logic diagram tool with additional logic associated with the hot water system including the building occupancy control logic and the hot water pump control logic. The narrative sequence with the additional enhancements added. The point list with the additional points required by the revised logic added. The zip file below contains the SketchUp model of the condenser water system we were looking at towards the end of class along with the system diagram for it. The PID resources I mentioned in class are on this page. These zip files contain the models and associated scene guides that I will be using for the class this afternoon if you want to work along with me using a copy of SketchUp on your laptop. Most of my models have scenes in them, which are simply preset orientations in the model that set you up to observe something with out having to navigate so much and maybe turn a layer off. A scene guide is simply a little table that has thumbnails of each of the scenes on it along with the scene number and a brief description to help you find the one you want more quickly. You don't have to have the models and work with them during the class; you will be able to simply work with me as I project images and move through the models. But in the past, we have found that some people like to have a copy they are following along in. And sometimes people want to use the models after the class.